The Call duck is a lively charming little bird with a small body and a short bill. They have a high –pitched call which travels over long distances. They were originally used by hunters to attract wild ducks. They are very chatty so if you have close neighbors beware!! . They are clean tidy birds which are easily tamed with a few treats. As they are small and quite light weight they can fly so you need to ensure their wings are clipped. Great to watch as they are an active gregarious character, quite addictive!! 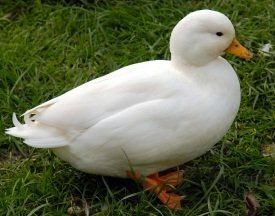 The Call duck is the smallest breed of domestic duck, weighing only 1-1/2lbs. They were literally developed as calling ducks, to call down the wild mallard to the great traps or decoys of the Fenlands of the UK and the marshes of Holland. They were first known as the decoy duck, the name coming from the Dutch word ‘de kooi’ meaning ‘the trap or cage’. 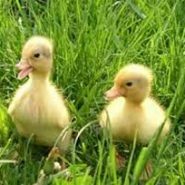 Call ducks are not great layers and the females are most likely to lay in clutches of 8-12 eggs and if left to sit and hatch them out the duck will look after the resulting ducklings with great care and attention. 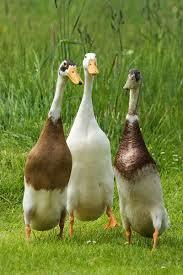 Ducks are excellent foragers and will hoover up all your slugs and snails . Be the first to review “Call Ducks” Click here to cancel reply.